After two decades of service, Continental Brick began to have problems with their hammer mill crusher. As a solution, Innovative Processing Solutions specified a Stedman size reduction impact crusher and engineered a design to work the brick crusher into the existing system. The Stedman crusher easily handles Continental Brick’s 12” material and reduces lost production time. Continental Brick (Martinsburg, West Virginia) has been successfully manufacturing face brick in the same location since 1917 using the same material from the Martinsville Shale Formation located within a mile of their plant. Their product line includes face brick used in residential and commercial applications primarily in the Northern Virginia, Pennsylvania, Chicago, New York, Washington D.C. and Baltimore areas. Through the years, they’ve upgraded equipment based on their capital equipment budget availability. Their hammer mill crusher was starting to wear out after two decades of service. “It was just taking too much of our maintenance time and expense to keep our grinding operations running at needed productive levels (60 million standard brick equivalent/annually),” states Sult. He adds that this older equipment had numerous replacement parts to manage and there were no automatic systems on it (i.e. automatic opening, etc.). It took the company hours to do simple routine maintenance or repair because they had to unbolt the cover and remove it just to gain access to the working mechanisms. 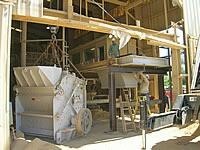 On average, their uptime availability was approximately 90% with their old hammer mill. Continental Brick called Innovative Processing Solutions for turnkey answers. The first step was determining the best replacement equipment, the second, engineering the solution to make it fit into the existing system. “We’re impressed with the ability of a single machine to handle our 12 inch material and give us the final output we need (-6 mesh) — and without needing to rework our system’s circuit design,” said Sult. 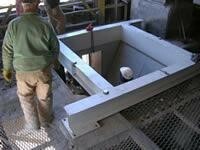 Retrofit engineering and installation of the Grand-SlamTM to the existing frame was a big challenge. Modifications were made, including a feed chute design to fit the new stand and crusher for proper material feed into the crusher’s inlet. With only five days to complete the installation before the shale inventory was depleted, Innovative personnel found cracks in the old frame. A new frame (10’ x 15’ by 10’ high) was quickly fabricated to replace it and production schedules were met. An affiliate of Stedman, based in Aurora, IN, Innovative Processing Solutions specializes in custom solutions for size reduction and bulk material-handling systems. They use equipment from Stedman and other top manufacturers to create a variety of systems, ranging from single processing stations, bins, and conveyors to complete turnkey systems. Innovative Processing Solutions’ primary markets include aggregates, industrial, powder, brick, cement, chemical/CPI, detergents and food. Turnkey design and engineering services include process specification development, system layout, equipment fabrication and installation. For more information or testing procedures contact us.